This is a collection of articles covering an important milestone event in auto racing – the first time a driver covered a lap around a mile track in less than a minute. This occurred at the Indiana State Fairgrounds one mile dirt oval in Indianapolis on June 20, 1903. 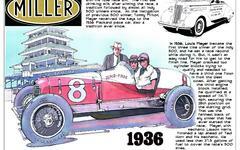 Indianapolis Motor Speedway founder Carl Fisher organized the race meet where this feat took place. Barney Oldfield, driving a Tom Cooper prepared Ford dubbed the “999,” pulled off the accomplishment. Holy Grail! The One Minute Mile! This article highlights the first ever lap of a mile track in under 60 seconds as achieved by Barney Oldfield on a Tom Cooper prepared Ford "999" racer. This was the first race car designed by Henry Ford. One Minute Mile - "Motor World"
This is Motor World's coverage of the breakthrough milestone of covering a one mile track in under 60 seconds (59.6) by Barney Oldfield on June 20, 1903. This article focuses on Barney Oldfield's milestone achievement of busting the one minute barrier for a lap of a mile track. The date was June 20, 1903, the car was a Henry Ford designed racer, the "999," and the time was 59.6 seconds. Tom Cooper, who partnered with Ford on the development of the cars, was a former national bicycle racing champion (1899). Cooper and Oldfield drove identical Cooper-Ford racers. Of all the accounts of Barney Oldfield's spectacular drive to record the world's first one mile track lap under 60 seconds, this one from The Automobile has to be the best. Colorful, it has a ring of poetry to it that places you there. The drama of the two friends, Tom Cooper and Barney Oldfield, pushing each other to drive harder and harder in their Cooper-Ford racers. This article from Horseless Age is the polar opposite of the The Automobile's colorful account of Barney Oldfield's barrier-breaking performance. Horseless Age, among the more technical of the trade papers of the day developed a distaste for auto racing, especially contests of what they called "freak" racers that had little in common with the stock cars of the day. This article from the little known Indianapolis Sentinel provides detailed coverage of the race meet at the Indiana State Fairgrounds on June 20, 1903. In addition to highlighting Barney Oldfield's brilliant effort in cracking the one minute barrier for a lap around a mile track, the article covers all the other events at the meet. This is a marvelous article describing the arrangements for the June 20 race meet at the Indiana State Fairgrounds organized by Carl Fisher. It has a complete card of the day's events and underscores the big attraction of the day was the Barney Oldfield vesus Tom Cooper match race in their identical Cooper-Ford racers. Oldfield broke the one-minute barrier for a lap under 60 seconds on a one-mile track at the meet. This package includes three days of coverage from the Indianapolis Star about the June 1903 auto race meet at the Indiana State Fairgrounds. The best single package of content about this historic event, this material covers preparations for the event, the entrants, a rain delay and the dramatic climax of Oldfield shattering the mile-a-minute record for a lap around a mile track in his Tom Cooper prepared Cooper-Ford racer. This is a brief article on Barney Oldfield's recording busting run to record the first lap in under 60 seconds around a mile track. This occurred June 20, 1903 at the Indiana State Fairgrounds track in an event promoted and organized by Carl Fisher. Fisher later when on to found the Indianapolis Motor Speedway in 1909.